The travel booking website Expedia is running a series of ads in the British newspapers (and possibly elsewhere — I don’t know). The aim is to encourage us to book hotels enabling us to explore different parts of Britain and Ireland. • rhyming slang, a well-known feature of traditional Cockney. I’ve never heard these versions of hurry and money, but they’re perfectly plausible. • h-dropping, found throughout working-class England, but stereotypically associated particularly with Cockney. • more respelt as maw, which implies no change in pronunciation for Londoners, since both are mɔː ~ mɔə. All these features are also found elsewhere, but happily evoke London. In case we’re puzzled, there’s a giveaway: they’re talking about Dublin. But in one detail it seems to me to be somewhat inept. • the respellings cast and tap, for cost and top, reflect the fact that unrounded vowels in the CLOTH-LOT set are typically to be found in Ireland (or of course the US and Canada), not in England. Fine. • nex for next, represents cluster reduction kst→ks before a following consonant in connected speech. This is found in virtually all kinds of English, including RP. • nuttin for nothing reflects (i) the use of an alveolar n rather than a velar ŋ in the -ing ending, and (ii) TH stopping (θ→t). The first is found as a “low” variant throughout the English-speaking world (except, apparently, among white South Africans), while the second is indeed a characteristic of Irish English (though also of Caribbean English, NYC etc). • noight for night. This appropriately suggests a lower-class Dublin ɒɪ PRICE vowel, though it could apply equally to London or Birmingham. • oyt for out. Who uses ɔɪ or similar in MOUTH words? Not Dubliners, not anyone much in the Irish Republic (sorry, the Republic of Ireland). Rather, qualities such as ɑy, ɒɨ are associated with the distinctive accent of Northern Ireland, particularly perhaps with Belfast. Not Dublin. Or am I wrong? In Belfast [aʊt] will be pronounced [ɔyt] (not ɔɪt) though. Nuttin had better be noottin, as lower-class Dubliners merge FOOT and STRUT. Why the hell ter? Ta would have sufficed (and wouldn't have puzzled me as much). Yes, I ought to have mentioned ter (= to), which makes sense only to non-rhotic speakers. I agree that ter for [tə] is inappropriate for Irish. It doesn't seem necessary when almost all English speakers use [tə] as a weak form. This is the problem with eye-dialect. As a speaker with no FOOT-STRUT split, I associate oo with /u:/ and not with /ʊ/. I associate u with /ʊ/. I think that this makes sense for writing in such an accent, as otherwise you end up using oo for two phonemes and not using u at all, since /ʌ/ is absent from these accents. I wonder if anyone not familiar with Stoke can work out the eye-dialect in May and Mar Lady. I (American) do have the FOOT-STRUT split, and I also would not associate oo with /ʊ/. While oo is the only way /ʊ/ is spelled for me (I'm pretty sure, anyway), still, if sounding something out oo is always /u:/. So, there wouldn't be any way to eye-dialect spell a word to indicate /ʊ/ as the vowel. In a British context, this spelling device is very familiar in the expression "oop north" (= up north). It's just occurred to me that Northerners use u for /ʊ/ in txt spk. For example, "good" becomes "gud", "could" becomes "cud", "would" becomes "wud", etc. I imagine that this doesn't seem very sensible to anyone outside the northern half of England. I've done the same, and I probably did even before going to Dublin and picking up the FOOT-STRUT merger. <u> is pronounced as FOOT in put, after all. And even in RP, there's /ʊ/ in "pudding" and hence also "pud", so "gud" etc isn't so disastrous a spelling. I read the last one as Birmingham, though the 'nuttin' is odd. And I ought to have mentioned that authentic Cockney rhyming slang involves suppression of the rhyming element (e.g. as in butcher's 'look', from butcher's hook). 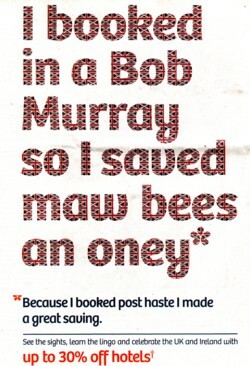 So you'd get just Bob and bees here. 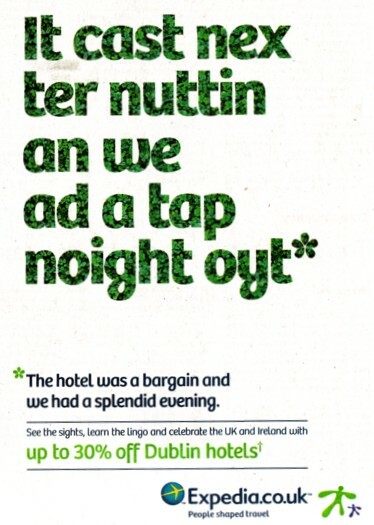 You're quite right - oyt is definitely what Dubliners would call a "Nordie accent". And ter is a particularly unfortunate choice of eye dialect, as Army1987 points out. In fact I can't help taking offence at this linguistic ignorance of my home country! The country, as even the U.K. government now concedes, is called 'Ireland'. If you wish to avoid confusing it with the island of Ireland, which even the Irish government now concedes is not coextensive with the country, you may describe it as 'the republic of Ireland' (it is the only republic on the island) or, less standardly, as 'the Irish republic' (it is the only Irish republic in the world). But these are descriptions, not names, and do not take capital letters. Just another polite notice from your resident Political Officer. Go raibh maith agat us ucht an ruda seo a rá, a John. @John Cowan: Everything you say about the political terms is pretty much OK, except that Ireland is also a geographical term, referring to the island as a whole. For this reason it's often avoided as a political term when there could be confusion, hence the widespread and sensible use of Republic of Ireland. You have a point though, that “Republic of Ireland” should really be spelt with a small R. But it’s not—it’s always spelt with a capital. Anyway the isogloss in question (oyt) doesn’t follow the political border: It cuts through counties Donegal and Cavan—both in the Republic. That's why I usually say “Ulster English” rather than “Northern Ireland English”. Here: http://www.youtube.com/watch?v=zXsozJoIJos&feature=results_video&playnext=1&list=PL3D2A1E8D62ABD892 one can hear both the deputy returning officer for Antrim North and Ian Paisley saying (in 1974) "thousand" (repeatedly), "count" and perhaps some other MOUTH words. How would you transcribe that pronunciation? did I hear you aright?